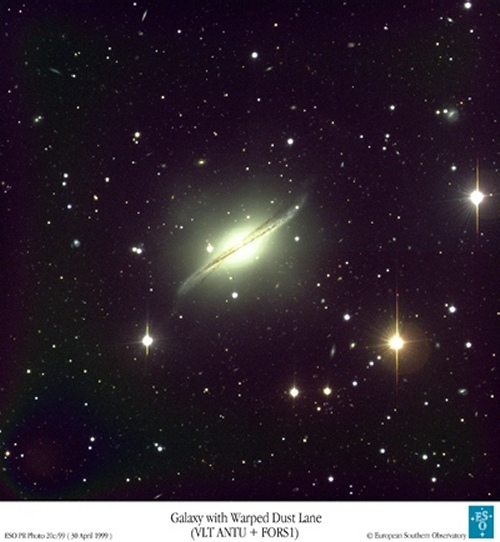 Click on the small picture to access a bigger and more detailed image of the displayed galaxy. Galaxy of type Sc in Eridanus (the Celestial River). Distance : 100 million light years. Notice the color difference between the reddish nucleus (old stars) and the arms, full of young blue stars. Note also the small satellite galaxy, shaped like the greek letter Θ on the bottom left. 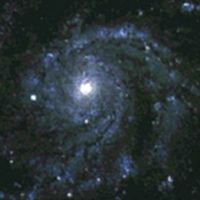 NGC2997, in Antlia (the Air Pump), Southern hemisphere. Lying at 55 million light years, it is nearly the same size as the Milky Way. 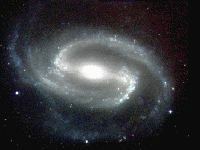 NGC4603, a class Sb spiral galaxy in Centaurus (the Centaur). Distance : 108 Million light years. This distance could be precisely estimated with the Cepheid stars in the galaxy, that the Hubble Space Telescope was able to spot. 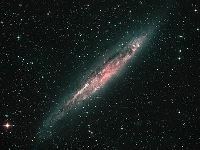 The reddish filaments that you can perceive in the arms are dust areas, which dim the light of the stars. 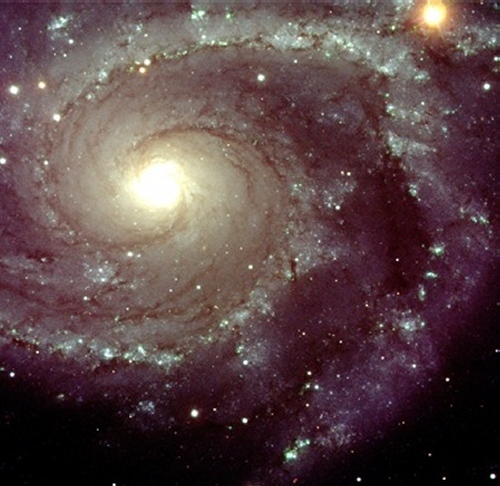 Sc Spiral Galaxy situated in Coma Berenices (Berenice's Hair). Distance : 56 million light years. It is one of the brightest galaxies of the Virgo cluster, easily visable with a small telescope. 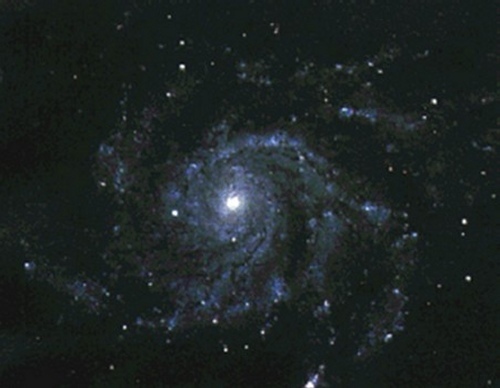 You can clearly perceive the thick dust and gas clouds in the two spiral arms. Distance : 37 Million light years. 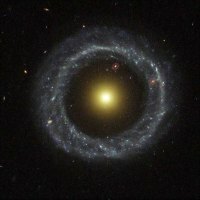 Class Sc Spiral Galaxy in Canes Vetatici (the Hunting Dogs). 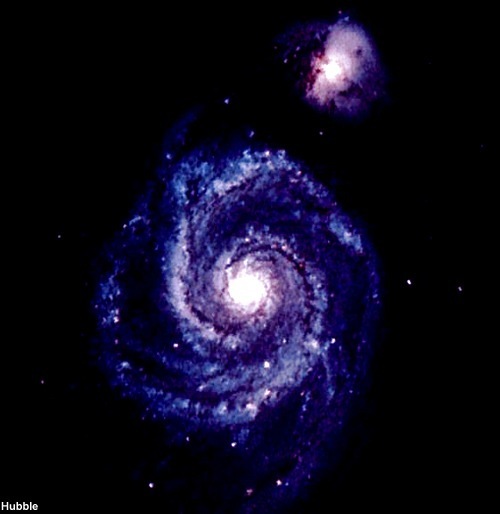 The clearly marked spiral structure is the result of the interaction between M51 and the small nearby satellite galaxy (NGC5195). M51 is also a powerful infra-red transmitter. 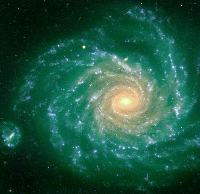 Class Sc Spiral Galaxy in Ursa Major (the Great Bear). Distance : 25 Million light years. 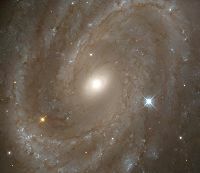 Its diameter is 170,000 light years, it is one of the largest known spiral galaxy. The nucleus is clearly out of center in respect with the disk. A barred spiral galaxy, class SBb. 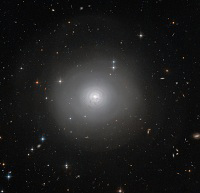 PGC 10922, a lenticular galaxy, taken by the Hubble satellite. One can clearly tell the dark dust spirals which encircle the bright center. Faint arcs on the outer edge of the galaxy are likely the result of a gravitational encounter, or a merger, with another galaxy. NGC4945, an irregular galaxy, 12 million light years away in Centaurus (the Centaur). 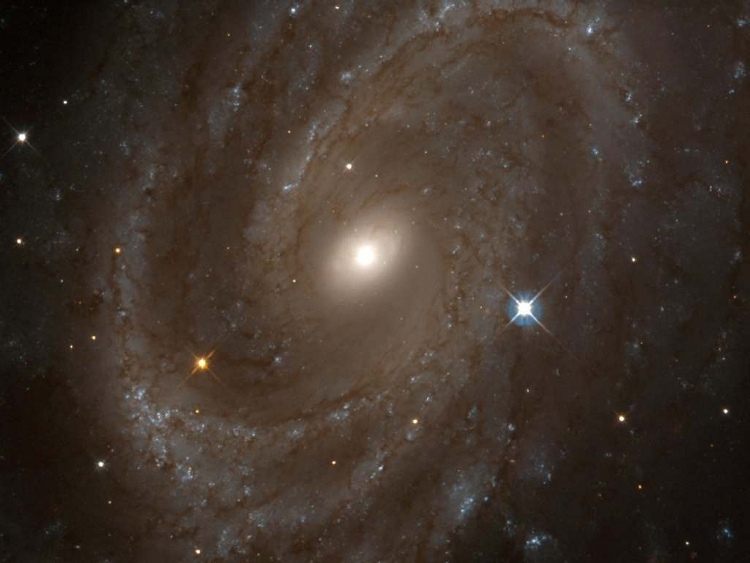 A 100,000 light year diameter galaxy, lying 170 million light years away in Hydra (the Water Serpent). 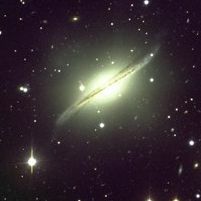 Although this galaxy looks like M104, you will notice the twisted aspect of the dust disk. This one has been formed recently (on an astronomical timescale), and is currently realigning with the main part of the galaxy. This galaxy is probably the result of a collision between an elliptical galaxy (the nucleus) and a small irregular one, full of gas, which supplied the dust disk. 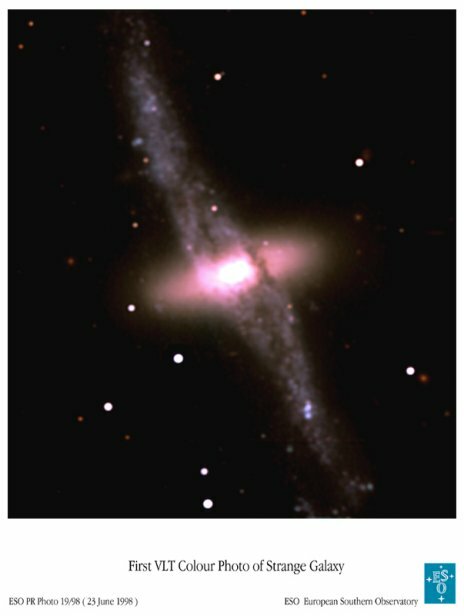 NGC3314, 115 and 140 million light years away in Hydra (the Water Serpent). The two spiral galaxies are not colliding, they just lie in the same visual axis. They are separated by 25 million light years. Notice the dark lanes in the foreground galaxy, which can clearly be seen due to the light of the background galaxy. Discovered in 1950 by Art Hoag, this unusual galaxy is about 120.000 light years wide, and lies 600 million light-years away in the constellation Serpens. The blue ring of young stars and the lack of spiral arms contrast with the yellow color of the nucleus, made of old stars. Such a galaxy may be the result of a collision. One can compare this picture with the Cartwheel Galaxy. 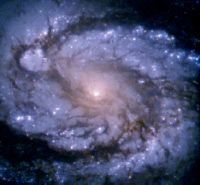 But the lack of remainders of another galaxy may suggest another hypothesis : an old barred spiral galaxy, whose bar has dissolved. NGC4650, 130 million light years away in Centaurus (the Centaur). You can distinguish a class S0 lenticular galaxy , which comes with a perpendicular ring of gas, dust and stars. LStars are mainly old ones in the galaxy (red) and young ones in the ring (blue). 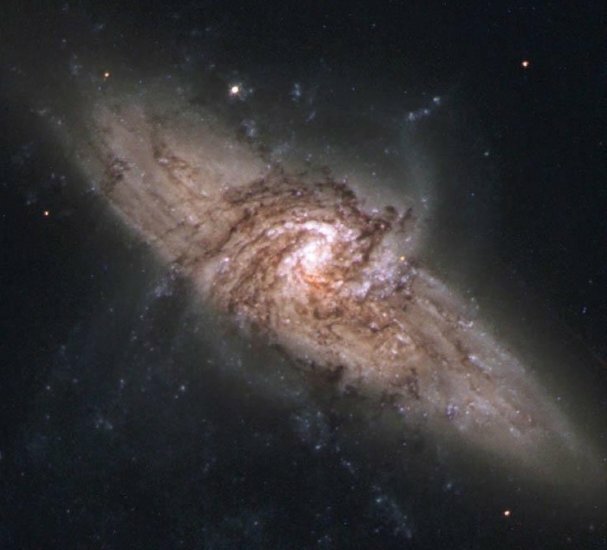 Such a system is, with no doubt, the result of a galactic collision. 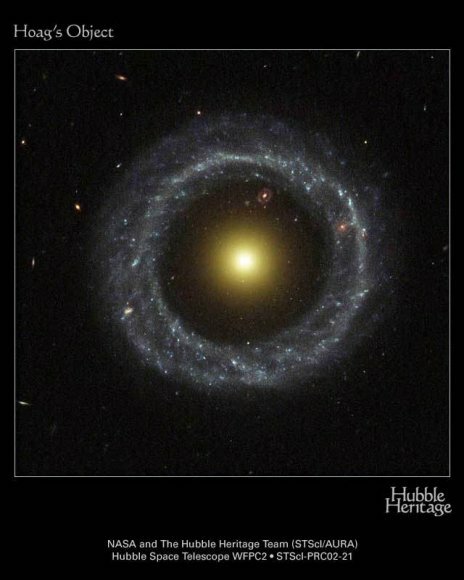 It's quite a rare phenomenon, called a "polar ring galaxy". But, in order to exist, it calls for a great quantity of hidden mass.